They say ‘you are what you eat’. If that’s the case, there are many who would be nothing but saturated fats, sugars and alcohol. And these people no doubt would be sluggish, lethargic and generally unhealthy. How do you eat right if you don’t know any better, though? You see a dietitian! They’ll do more than just help you lose weight; a good dietitian will work with you to create a lifestyle that’s healthy and attainable. 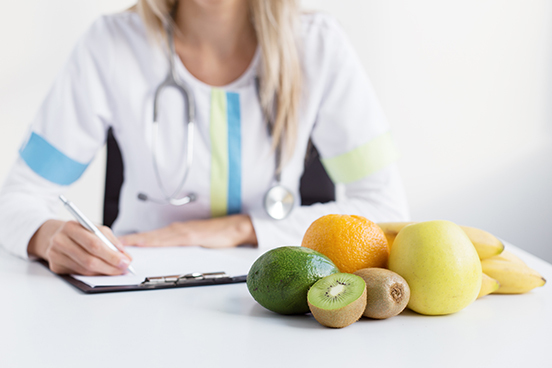 At your consultation with a dietitian they’ll take a comprehensive history, including past and present conditions, what brought you to the practice, the kinds of food you currently eat as well as what you don’t/can’t eat, and what you hope to get out of the consultation. They will explain what your condition means for your diet, and how good nutrition plays a vital part in managing your condition as well as your general health. Subsequent reviews will fine-tune your diet, so that you can stick to it. If you have a food allergy, for example, a dietitian will help with advice on how to avoid those foods that will trigger a reaction, as well as foods that you can substitute for the allergens. They will inform you on what foods those ingredients can be found in, and what their alternate names are. If you have coeliac disease, for example, gluten can be found in a range of foods and may not be labelled “gluten” for you to easily identify. A good dietitian won’t only help if you have a diagnosed condition – they’re also available for general health and well-being. Make an appointment today!